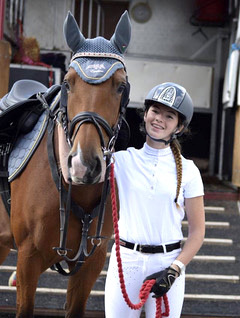 I am a 17-year-old Showjumper from Essex I have a warm blood mare called Sassy and have the ride on a Connemara called Skipper! In my first 8 weeks with Sassy we gained all our DCs for BN and Discovery along with some very high placings qualifying for a variety of things including BlueChip and Aintree Amateur Champs. However, she was badly burnt in a stable fire in January in which she sustained 2nd degree burns to her back and neck. We are now starting the process of bringing her back into work. In the meantime, I have had the opportunity to ride and compete some lovely horses including Marley an 11yo Warmblood gelding. I am a dedicated rider and when the going gets tough, I’m just starting getting going! No matter the situation I try to keep a positive attitude and find a way to work through it which we have shown especially after the fire (January).